Michael Rohd is a phenomenal facilitator who has significantly influenced my practice. He studied Theater of the Oppressed and practices what he calls "Civic Theater," an approach to community dialogue that is similar to Theater of the Oppressed, but puts more emphasis on the value of dialogue, on community member identifying critical questions and exploring them through both physical and verbal interactions primarily through theater-based games. This book outlines civic theater projects and exercises Rohd conducted with youth. This book by Roberto Vargas shares his innovative approach to community organizing and family development. He applies concrete social change strategies to improving family dynamics while helping to assert the values of family connection to the world of community organizing. I find this book to be a critical resource for facilitators seeking to support individuals and groups in seeing their power to affect change in simple and profound actions at home and in community. When we see everyone as family, we take responsibility for our world in loving and thoughtful ways necessary for the social transformation our current crises are calling for. 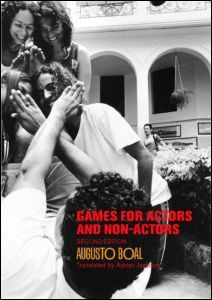 Augusto Boal, Brazilian popular educator and theater artist, canonized Theater of the Oppressed and his book is the definitive guide to its core techniques. I consistently draw upon and adapt the Theater of the Oppressed arsenal of exercises to create dynamic facilitation spaces for creative and inclusive problem-solving. The book is much easier to use after having experienced the exercises as a participant. I recommend taking a Theater of the Oppressed training for trainers and using this book as a sort of handbook. Use post-its to jot down your experience with each exercise as well as any ideas you have about how to use specific exercises in your work as a facilitator. They are unparalleled for facilitating whole group analysis of power in its many forms and to explore how to best wield power for social change.